People need a strong you if you want them to rely on you. Take care of yourself, be good and healthy so you can take care of others after. You can’t help another person when you are not in a strong physical and mental condition. Well, you can but the amount of help you provided would be low. Also, you would lower your own energy helping but only increase the helped person’s energy by a small degree. To say it harshly: Your help would be a waste of energy. Start by being well yourself. 100 percent. Having more energy in the beginning means the recovery from an energetic consumption (helping someone else) happens quicker. 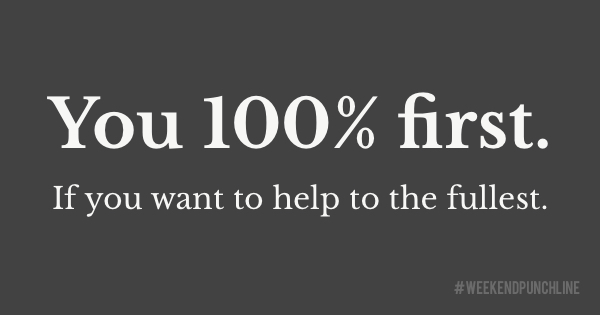 You don’t want to exhaust yourself to zero percent when you help. I don’t know your energy level and how much energy you can invest. But keep in mind that you need energy for your own sustainability (vital functions) and energy to recover from the consumption. On the plane when you listen to safety instructions you usually learn to put on your life vest and mask first, then assist others with their mask and vest. It’s a very simple instruction but in panic (when rational thinking is shut down) you follow your instinct. Your instinct tells you to survive, but in the case of a mother your instinct would tell you that your child needs to survive first. So, I’m seeing parents to be a group in the inherent danger of death when in panic. In their mind, the baby comes first. Fair enough. Even when you take safety instructions for granted and ridicule them, at least use the instruction time as a reminder to help yourself first. Then make others good and strong. This was episode 16 of the #weekendpunchline . Every Saturday and Sunday.